I think it is so important to listen to that little voice in your head when it shouts out to you, especially when you are doing a photo shoot and looking for good shots. For me it typically is out of the corner of my eye and the voice makes me stop and re-look again for a full view. This time the scene was in full view, but I was comfortably seated in a car on a ferry and didn’t want to fight the elements. 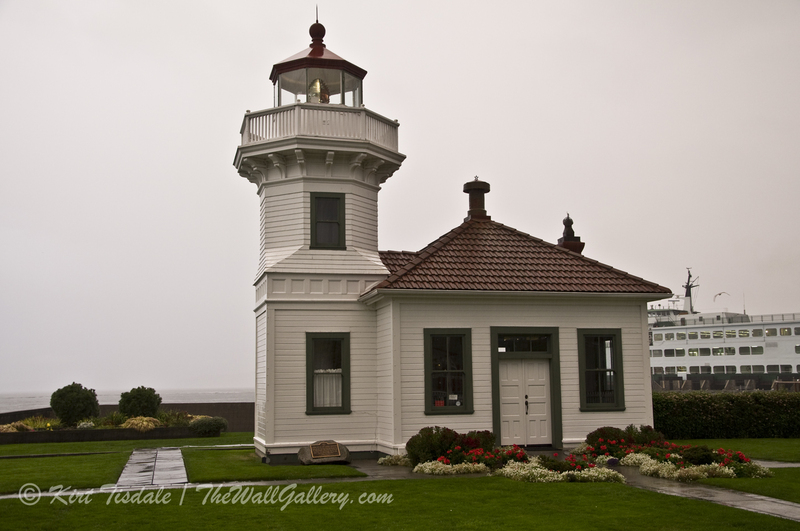 Last month when we were up in the Seattle area, we took a day for me to go around the Puget Sound and do a photo shoot of lighthouses. I have photographed most of the lighthouses from Northern California through Oregon into Southern Washington, but none around the Puget Sound. What a great day. My daughter and her boyfriend hosted the event so all my wife and I had to do was sit back, relax and enjoy the scenery. The weather was a complete mix of beautiful sunshine to pouring rain. Loved it!! We started in the Seattle area and worked our way north before returning south again. 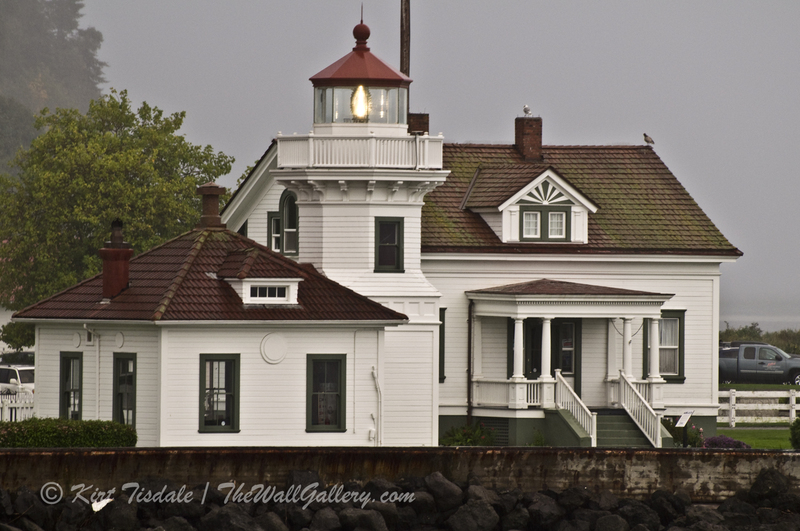 I will feature a couple more over the next few weeks, but wanted to start with our last one, the Mukilteo Lighthouse. You never know when and where opportunity will come for some great shots, so always listen to that little voice in your head. This is part of the series I took on the ferry showing the two caretakers homes and the lighthouse in the middle. This one is a little closer showing the one caretaker home and the lighthouse. Notice the blur of ferry portal wall on the lower left side and the slight angle of the shot needing straightened…back to my comment about not having cropped these shots yet. I used a little zoom as we started docking and caught the light just as it was shining on us. 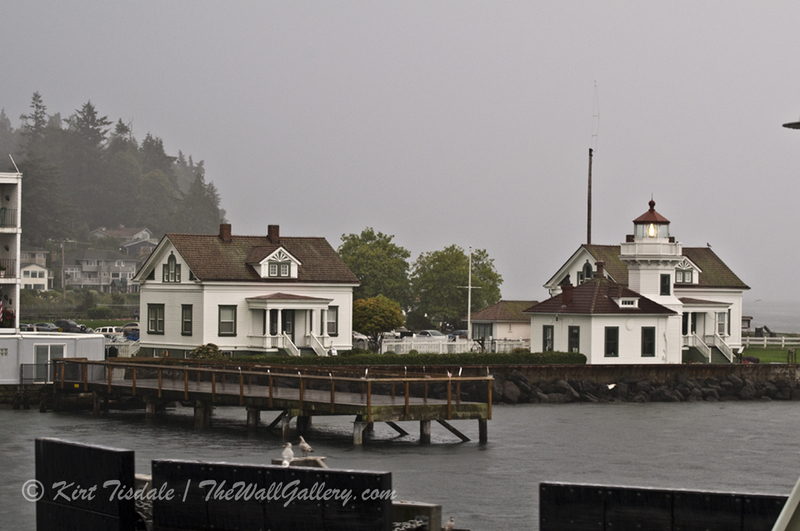 As we drove off the ferry and pulled into the parking lot for the lighthouse, the heavens opened even more. I told everyone that I thought I got some good shots and lets not worry about it. My daughter’s boyfriend wasn’t having any of it…he got the umbrella and said let’s do it…I’ll cover you. My wife and daughter at this point weren’t leaving the warm dry comfort of the car. So here we are two guys with one umbrella and a camera running around the grounds of the lighthouse and caretakers cottages getting some good shots in the pouring rain. In this shot, you can see the ferry in the background. The thing that amazed me the most was the size of the lighthouse; it looks like a dollhouse. I didn’t realize it when I was shooting from the ferry, because the other two buildings were seen at such an angle with the lighthouse it all looked as one. I did get some good shots with my umbrella assistant, but really like the others more. Reinforced lesson; always listen to that little voice in your head. Thoughts? 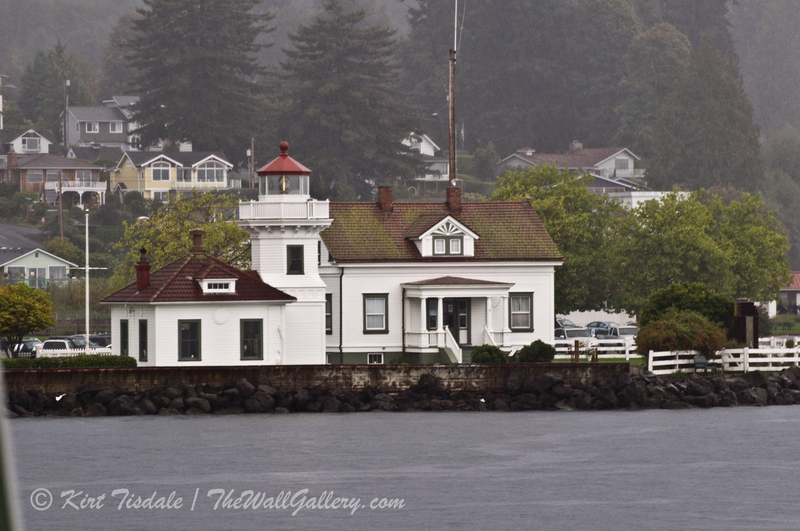 This entry was posted in Color Photography, Photography and tagged kirt tisdale, lighthouse, lighthouses, mukilteo lighthouse, mukilteo washington, online art gallery, photographer, puget sound, Washington State on October 30, 2014 by Kirt D Tisdale. 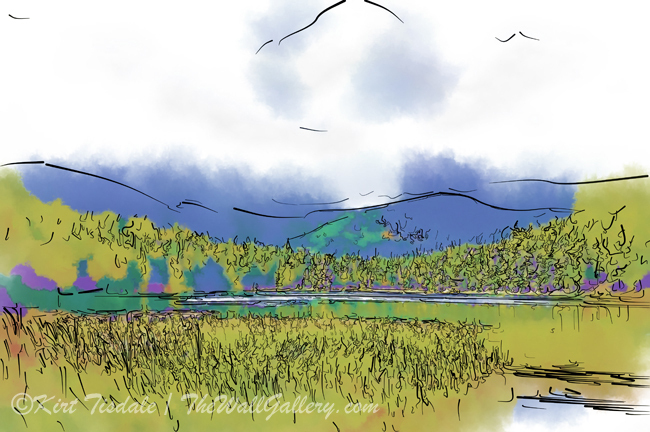 Today’s featured art print is titled: “Mountain Meadows”. It is a new addition to my Abstract Watercolor Gallery. I chose an abstract approach to a landscape scene to soften the look of the final piece. I used muted colors and strong suggestive lines to create the framework of the scene. At first glance, you may not be too sure just what you are looking at, but then you recognize the suggestive outlines of hills, trees and grass. You see a smooth area, which you now see as a lake or pond. Your eye is pulled into the print trying to figure it out. The abstract approach creates some different elements in a print. It uses a different methodology presenting a picture. If it were a true impressionistic approach, the shapes and colors are more about evoking a response or an emotion versus portraying accurate detail. I like that approach with free form shapes and bold colors. Another approach to abstract art prints is a subtler look such as the featured art print. A specific scene is being depicted but without the detail found in a photograph or a typical art print. It is more suggestive of the subject matter letting your mind fill in the blanks. I have two abstract galleries, one done in oil techniques and one done using watercolor techniques. They both use the same basic premise, but the results are different because the elements are created in two distinctly different ways. The oil techniques typically produce bolder, stronger looks and the watercolor techniques create softer looks using more subtle methods. They both have their place in an interior design depending on the look you are going for. Thoughts? 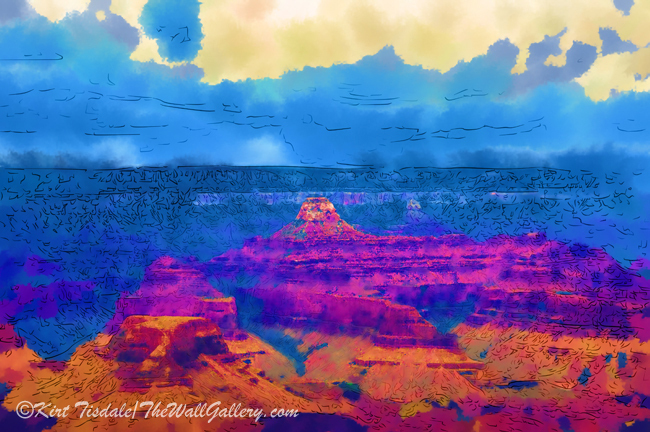 I invite you to come into the gallery to view the addition of art prints to the collection in Abstract Watercolor Gallery. This entry was posted in Abstract Watercolors, Landscapes: Watercolor and tagged abstract art prints, art galleries, artist kirt tisdale, interior design, lakes, meadows, mountains, online art gallery, watercolor art, watercolor landscapes on October 27, 2014 by Kirt D Tisdale. My last post was focused on capturing the beauty of a sunrise. This post focuses on the beauty of a sunset. Just by chance, I had just added some new art prints to my Abstract Oil Gallery. 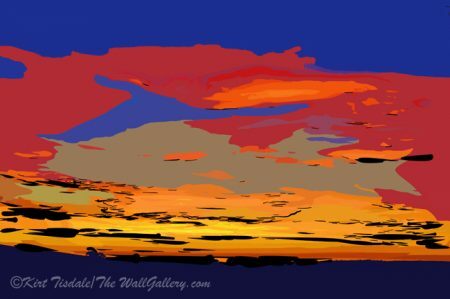 I had just finished with a series of abstract sunsets and I chose to feature one of them titled “Pacific Sunset”. This is an art print done in an impasto oil style, which is known for large bold brush strokes and bold colors. The setting is a sunset over the Pacific Ocean along the coastline in Carlsbad, California, which is located in the northern part of San Diego County. 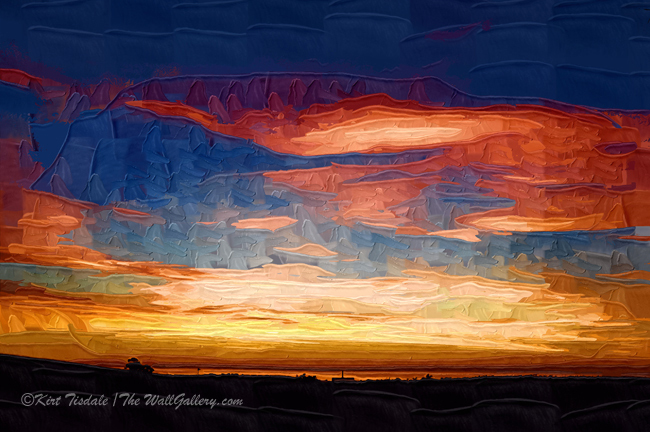 I tried to capture the essence of the explosion of color that occurs during spectacular sunsets. In this rendition, I focused on the blues, reds, oranges and golden hues of the sky after the sun has slipped below the horizon. The colors change so rapidly and wanted to present the sky as the light starts to fade and the dark night sky creeps in. I put this print in my Abstract Gallery because of the bold shapes and color that were used to create the full picture. The dramatic color and large brush strokes steal the attention, but to add a little balance, I pull your attention to the specific detail I captured along the horizon of the land. This helps to delineate between the land, ocean and sky. You see just a small sliver of ocean reflecting the colors from the clouds. Thoughts? 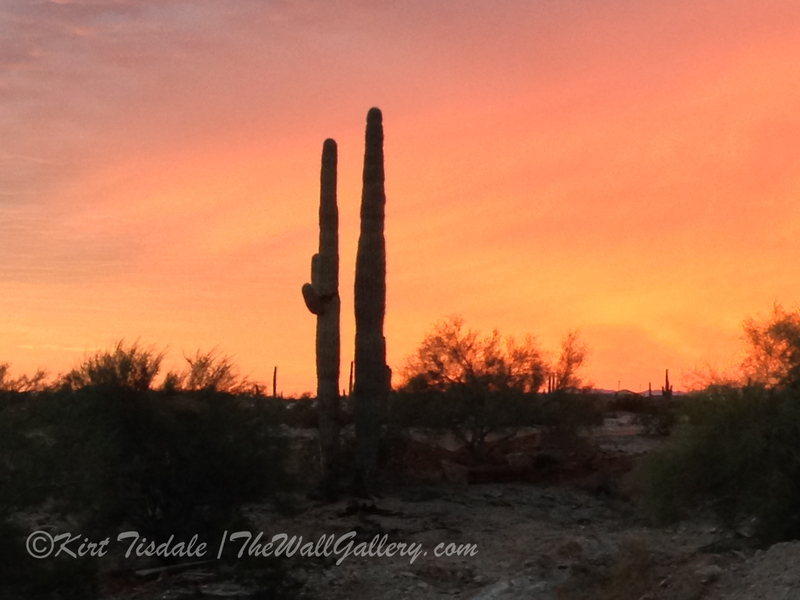 This entry was posted in Abstract Oil, Art Prints and tagged art gallery, artist kirt tisdale, california, carlsbad california, interior design, oil painting, online art gallery, sunset, sunsets on October 24, 2014 by Kirt D Tisdale. Last week early one morning and I mean early one morning, I walked out onto our patio, coffee mug in hand. I was ready to sit down and enjoy my coffee as the sun was just starting to lighten up the sky. Our patio faces the eastern sky, so I was looking up expecting clear skies (it is the desert), but instead saw a lot of high-level clouds. (I’m sure you’re thinking “thanks for the weather report Kirt, but really…) The clouds caught my attention because I know that these types of clouds can make a spectacular sunrise or sunset depending on which is happening. 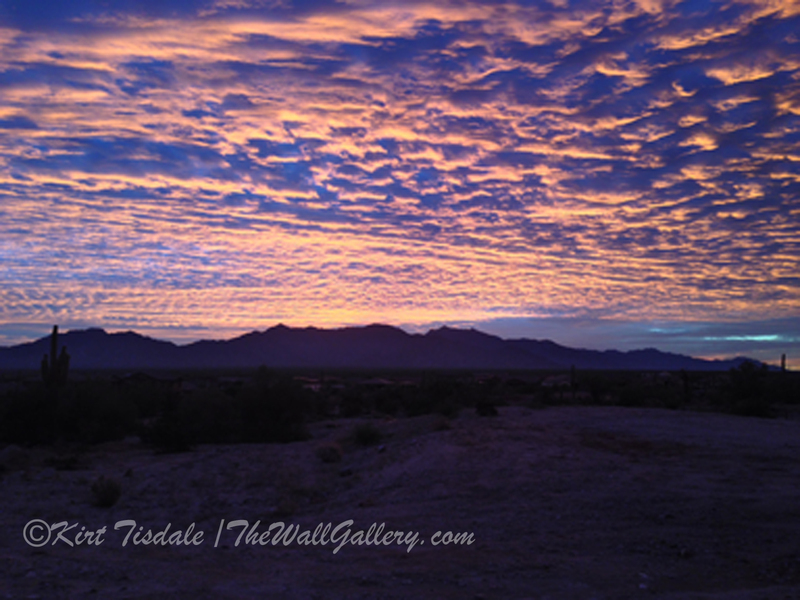 Our area is straight west of a mountain range, so our sunrises are more impressive coming over the mountains. I knew I didn’t have much time; so coffee cup gets sat down, I go screaming into the house to grab my camera and dart out to hike up a hill nearby for some cool shots. I didn’t have time to grab my tripod because at this point the sky was changing already into an incredible display of color. The change to the coloring is ongoing and fast as I get up the hill and get my camera ready for some spectacular shots. I position myself and start taking shots…nothing happens…huh? Thought I had turned it on…check again (which means reading glasses back out), yes it’s turned on, but display is blank…..dead battery. I forgot I had been downloading pictures from my camera into my computer a few days back and obviously left the camera on. Knowing that I didn’t have time to get back to the house for the other set (I always have a backup charged and ready), I reverted to my iPhone. The iPhone takes decent enough shots, but not as clear as I would have gotten with my camera. That said, I still wanted to share some of those shots from the sunrise. 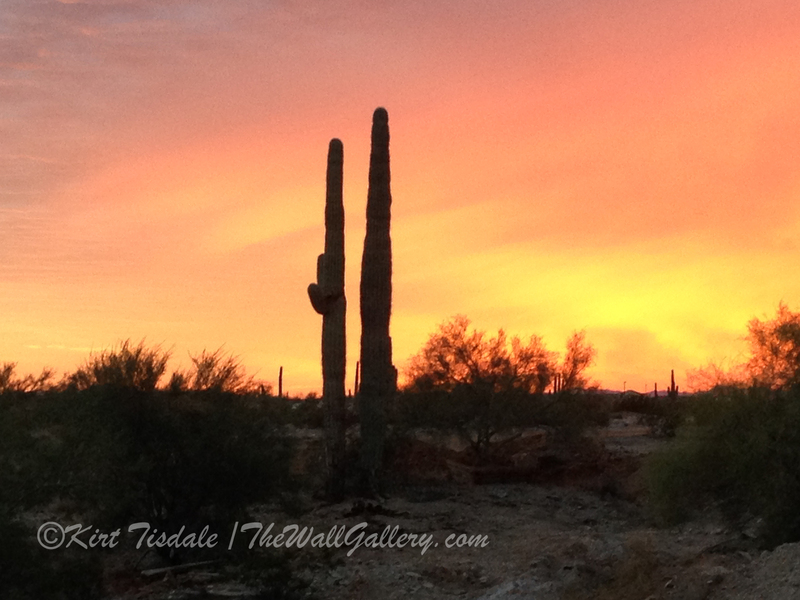 What I love about a sunrise or sunset is the coloring changes as you watch. I’ve attached a couple of them from that morning so you could see some of the subtle changes. The first shot is soon after I realized my camera batteries were dead. I started with a wider angle to get an overall look of the desert and the mountains in the east. The second shot is zoomed in a little tighter. Notice the slight color change…just a little brighter orange as the sun has moved further up behind the mountain. The third shot shows the sky just before the sun has peaked over the top of the mountains. The color is becoming brighter and the hues have changed slightly. As I waited a minute for the next shot, I looked to my right and noticed the color explosion on the next shot…. With the fourth shot, the sun is just about up and the light is reflecting off of some high level rain that is dropping from some clouds south of me. The last shot is that same view and the sun has broken the horizon. Notice the change from orange to yellow. All of these shots were taken within 4-5 minutes all total, that’s how quickly the colors change. 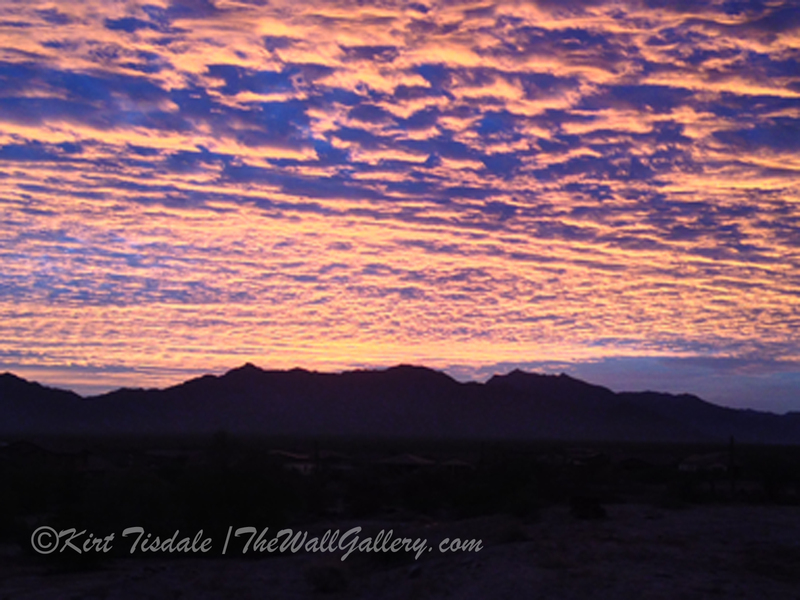 Once the sun came up, the dance of color in the clouds quickly disappeared. Thoughts? 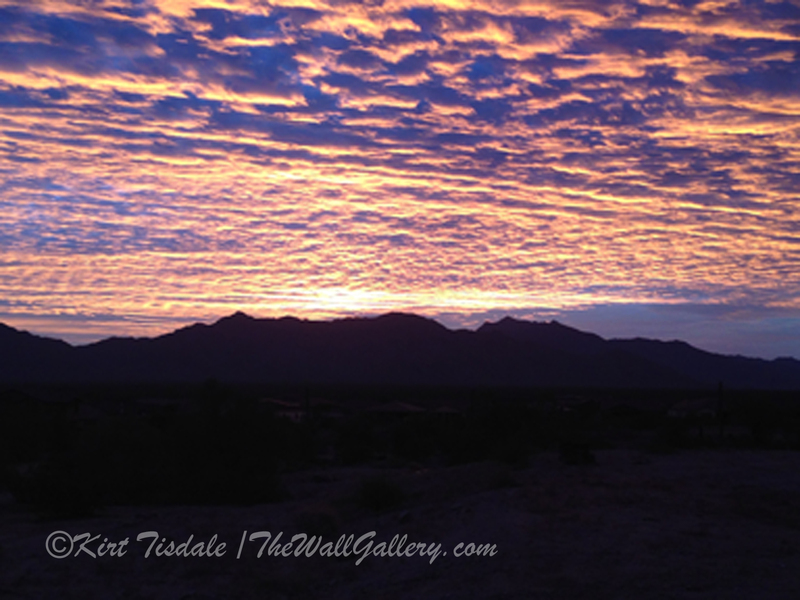 This entry was posted in Color Photography, Photography and tagged arizona, art galleries, desert, desert photography, kirt tisdale, mountains, online art gallery, photographer, sierra estrella mountains, sunrise on October 22, 2014 by Kirt D Tisdale. Just so everyone is clear, I hesitate to bring up Christmas at this point in time, but we are headed into November and the holidays will be here before we know it. So, in a continuation with the line of Christmas Cards I added to my Note Card Gallery, I wanted to feature another art print that I used for one of the cards. 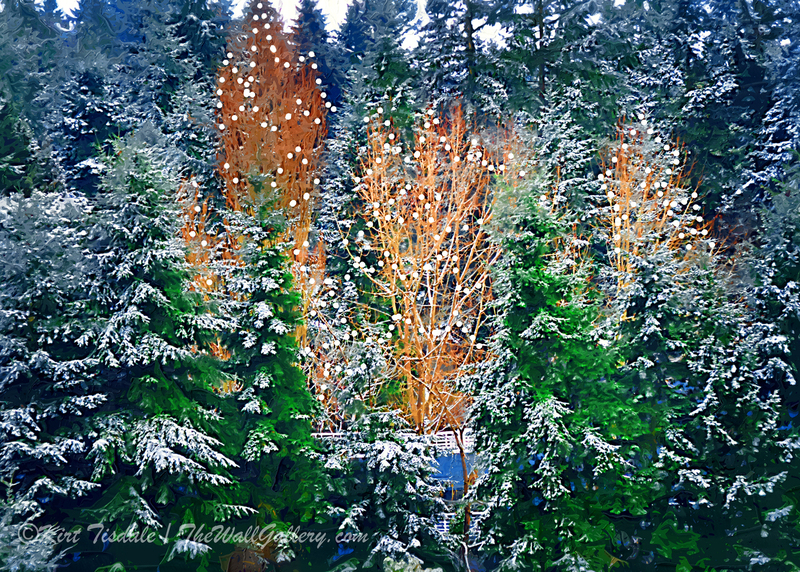 This art print is titled: “Tree Lights in the Clearing”. This particular print is not in any of my galleries as it is brand new. I had just created it for my Landscape Oil Gallery and something about it spoke to me for a possible art print on one of my cards. I liked the clearing of barren trees in the middle of a thick pine forest. In creating the print, I highlighted the barren trees and made them the focal point. I used a look of brighter light on those trees, making it appear that the trees were lit up…almost magically in the forest. For the card, I then took it one step further and created white lights on the trees creating a festive winter scene. My goal in the line of cards was to create winter scenes of nature that had a slightly nostalgic look and feel to them. Natural winter scenes depicting a simpler slower paced life. During the Holiday Season, we frantically prepare for it, but when Christmas and New Years arrive, we try to slow down to enjoy family and friends. It’s a time of love and community, a time of year to stop and reflect on where we are and what we want for the coming year. Thoughts? I invite you to come into the gallery to view the addition of Christmas Cards to the collection in the Note Card Gallery. This entry was posted in Art Prints, Landscapes: Oil and tagged art gallery, artist kirt tisdale, christmas, christmas cards, forest, inspirational, landscapes, online art gallery, snow, snow covered trees on October 20, 2014 by Kirt D Tisdale. I just added a line of Christmas Cards to my Note Card Gallery and wanted to feature one of the prints from those cards. My feature today is titled: “Christmas Tree in the Forest”. I started by taking the art print from my Landscape Oil Gallery titled: “Snow Covered Pine” as my basis for this creation. From the original print, I popped the color up just a little and then individually added each light, the star and then the glow around the star. Sounds easy enough, but it was a little more time consuming than I had estimated. I can’t even begin to tell you how many times I re-drew the star until I had it the way I wanted. I really like the final results and feel like the effort was worth it. Some background on the scene: It was the first part of December 2013 and my wife and I were living in Seattle for the latter half of last year while our house was being built here in the Phoenix area (two of our three were in Seattle at that point and we had sold our home in San Diego). Our apt had just flooded (another story for another day) and we had to vacate it for the duration of our stay. We ended up in a hotel for the holidays waiting for our final move to Arizona. It was a bit crowded with two cats, lots of my equipment, suitcases, etc in a one-bedroom hotel suite. We took the entire event in stride, but were feeling a little down because at least in the apt we had a small tree and it was decorated, etc. We were use to hosting Christmas at our house even after our kids moved out and this year we knew would be different, but not like this. We woke up one morning to a beautiful snowfall. It doesn’t snow very much in Seattle and we had not lived anywhere that got snow since our days in Denver many…many years ago. It was magical to us…that first snow where the flakes are huge and fall quietly adding that touch of white to everything. I knew I needed to get out in it and start taking pictures. Our hotel was near a small forest, so I packed up and took off. I loved it! 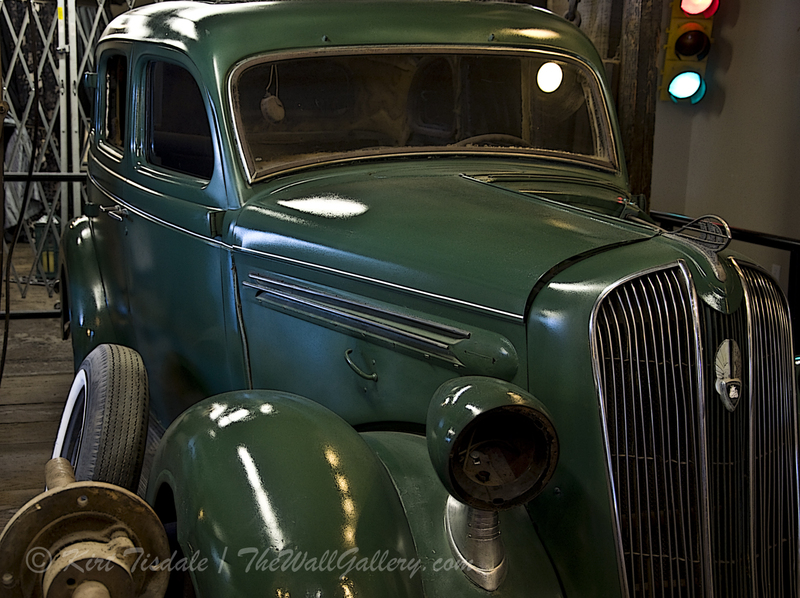 I was able to get a number of great shots that day and have started creating final art prints from those photographs. In thinking about what art prints to offer on some Christmas Cards, this one came to mind, but I wanted to decorate the pine tree with lights. Growing up, we always had a fir tree full of Christmas lights outside and when the snow blanketed it…magical. My goal was to recreate what I had seen so many times in my youth via this art print. Thoughts? 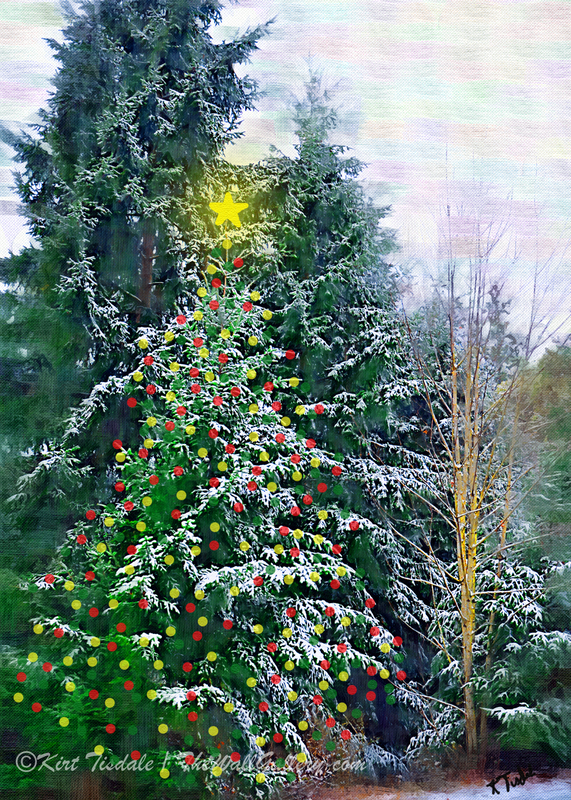 This entry was posted in Art Prints, Landscapes: Oil and tagged art gallery, artist kirt tisdale, christmas, christmas tree, forest, online art gallery, seattle, snow, snow covered trees on October 17, 2014 by Kirt D Tisdale. Using one of my recent photo shoots (Jerome, Arizona to be exact), I wanted to walk through a process to turn some of your photos into “old” prints. Lately, I have seen a lot of interior designs that use this type of look for their art prints. It may not be everyone’s taste, but there is a place for it and I thought I would show a couple of quick easy tips. 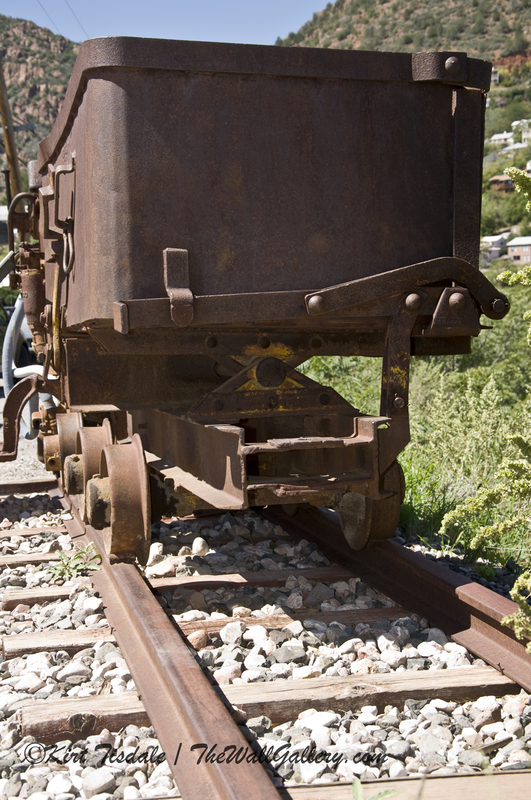 So the subject matter qualifies as old and rustic, we can all agree on that. The first process I took a look at was black and white. Black and white photography doesn’t by itself create an old look since it is used today to create some very modern contemporary art prints. That said, with the right subject matter a simple change to this monochrome look can create the “old” photo appearance you might be looking for. The next approach is the sepia tone photography. This alone creates an instant old look as we associate the sepia tone with pictures from the 1800’s in photography’s infancy. It works well with this subject looking like it could have been one of the original shots when the mine was up and running for business. This last attachment is the same shot with some texture (compliments of Photoshop) added to create a look of a photo on old paper (the texture is very subtle and difficult to see on this size). The point of all of this is to show you how easy with some simple steps, you can turn one of your photos into an art print for your wall assuming this a look you are after. Not to confuse the issue, but one last comment. An original old shot from the era my subject matter comes from, would have slightly different lighting with the center being brighter than the edges. That look can also be incorporated, but I didn’t want to make this a process that got cumbersome and the final result (which I also played with) was very subtle in the changes it made. Thoughts? This entry was posted in Photography, Sepia Photography and tagged arizona, art prints, interior design, jerome arizona, kirt tisdale, mining towns, old west, online art gallery, sepia prints, sepia tone on October 15, 2014 by Kirt D Tisdale.